3 Introduction Endopore Introduction to the ENDOPORE Dental Implant System It has been more than 20 years since research began at the University of Toronto, Faculty of Dentistry, to seek out alternative technology to threaded dental implants and since that time, the Endopore Dental Implant System has been successfully used in the treatment of thousands of patients in over 20 countries to restore oral function and esthetics and bring to these patients a greatly enhanced quality of life. 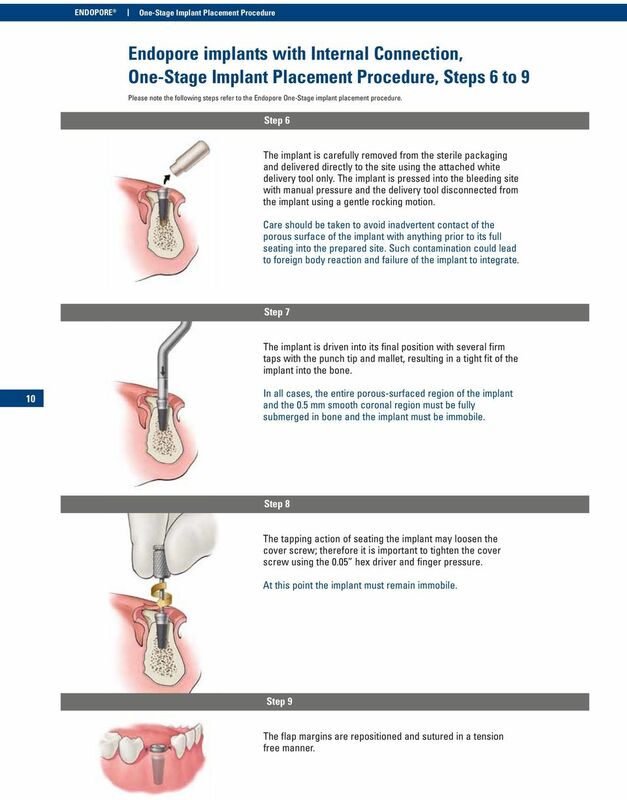 The purpose of this manual is to describe the surgical protocols for the Endopore Dental Implant System used in a: One-Stage Procedure Two-Stage Procedure Osteotome Procedures A wide range of prosthetic options is available from Sybron Implant Solutions for functional and esthetic restorations. 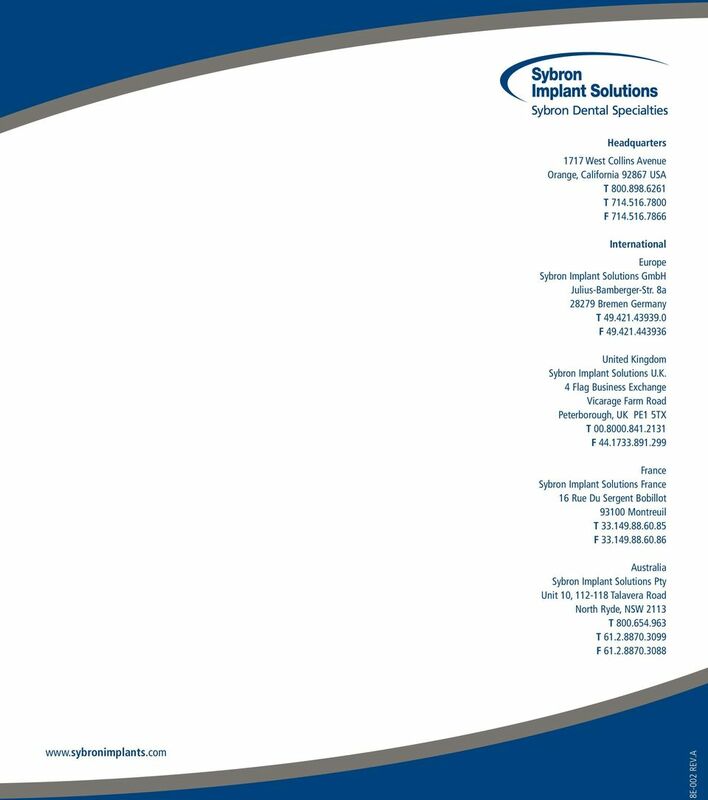 Additional options are available from Attachments International Inc., a Sybron subsidiary, which has over 25 years of experience in restorative dentistry. 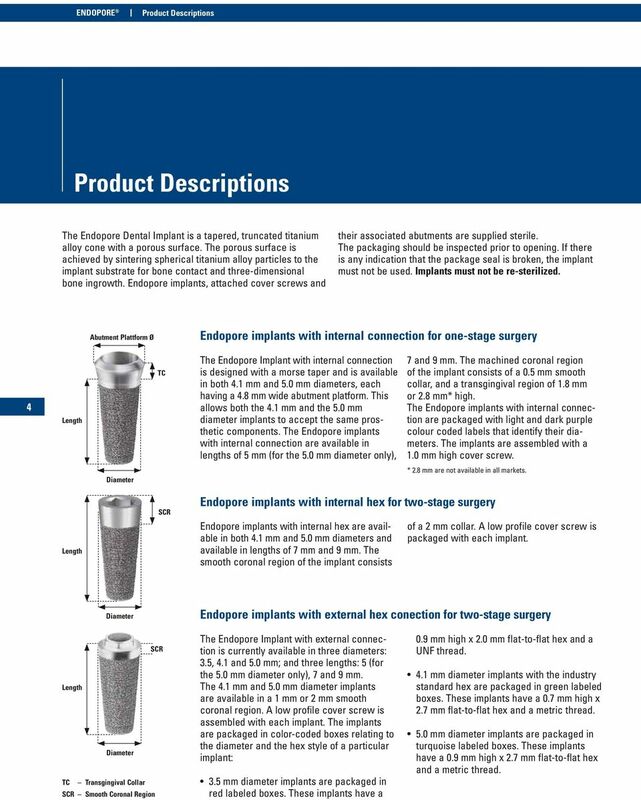 4 Endopore Product Descriptions Product Descriptions The Endopore Dental Implant is a tapered, truncated titanium alloy cone with a porous surface. The porous surface is achieved by sintering spherical titanium alloy particles to the implant substrate for bone contact and three-dimensional bone ingrowth. Endopore implants, attached cover screws and their associated abutments are supplied sterile. The packaging should be inspected prior to opening. If there is any indication that the package seal is broken, the implant must not be used. Implants must not be re-sterilized. Abutment Plattform Ø Endopore implants with internal connection for one-stage surgery 4 Length TC The Endopore Implant with internal connection is designed with a morse taper and is available in both 4.1 mm and 5.0 mm diameters, each having a 4.8 mm wide abutment platform. This allows both the 4.1 mm and the 5.0 mm diameter implants to accept the same prosthetic components. 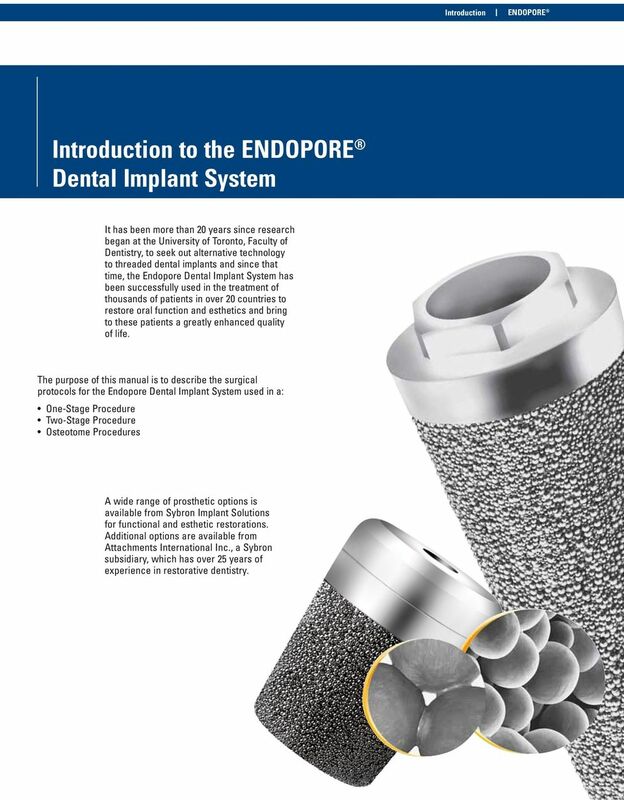 The Endopore implants with internal connection are available in lengths of 5 mm (for the 5.0 mm diameter only), 7 and 9 mm. The machined coronal region of the implant consists of a 0.5 mm smooth collar, and a transgingival region of 1.8 mm or 2.8 mm* high. The Endopore implants with internal connection are packaged with light and dark purple colour coded labels that identify their diameters. The implants are assembled with a 1.0 mm high cover screw. Diameter * 2.8 mm are not available in all markets. 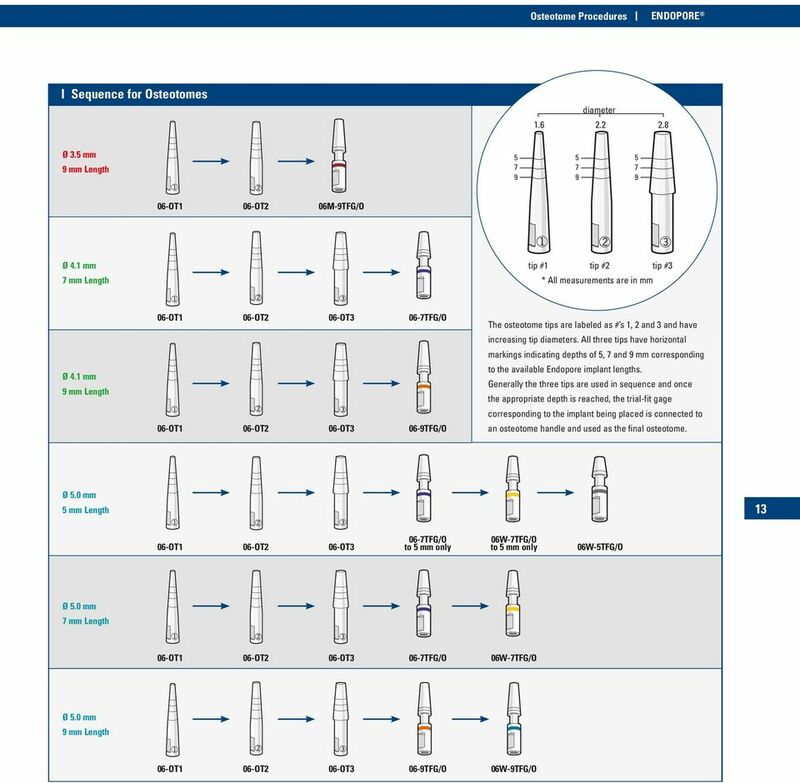 Length SCR Endopore implants with internal hex for two-stage surgery Endopore implants with internal hex are available in both 4.1 mm and 5.0 mm diameters and available in lengths of 7 mm and 9 mm. The smooth coronal region of the implant consists of a 2 mm collar. A low profile cover screw is packaged with each implant. Diameter Endopore implants with external hex conection for two-stage surgery SCR Length Diameter TC Transgingival Collar SCR Smooth Coronal Region The Endopore Implant with external connection is currently available in three diameters: 3.5, 4.1 and 5.0 mm; and three lengths: 5 (for the 5.0 mm diameter only), 7 and 9 mm. The 4.1 mm and 5.0 mm diameter implants are available in a 1 mm or 2 mm smooth coronal region. A low profile cover screw is assembled with each implant. The implants are packaged in color-coded boxes relating to the diameter and the hex style of a particular implant: 3.5 mm diameter implants are packaged in red labeled boxes. These implants have a 0.9 mm high x 2.0 mm flat-to-flat hex and a UNF thread. 4.1 mm diameter implants with the industry standard hex are packaged in green labeled boxes. These implants have a 0.7 mm high x 2.7 mm flat-to-flat hex and a metric thread. 5.0 mm diameter implants are packaged in turquoise labeled boxes. These implants have a 0.9 mm high x 2.7 mm flat-to-flat hex and a metric thread. 5 Surgical Instrumentation BICORTICAL Endopore Surgical Instrumentation Endopore Surgical Kit The instrumentation for placing the Endopore Implant consists of: round bur twist drills paralleling pins (occlusal guide pins) colour-coded implant burs colour-coded trial-fit gages three end-cutting osteotome tips both straight and offset handles (to which the tips are connected for use) a surgical mallet drill extension 0.05 hex driver tip wrench radiographic overlays stainless steel punch tip A surgical motor and handpiece with internal and external irrigation capability suitable for implant placement are necessary. 5 Instrument Care and Sterilization The Endopore Dental Implant System surgical instruments must be cleaned and sterilized prior to and following their first and every use. 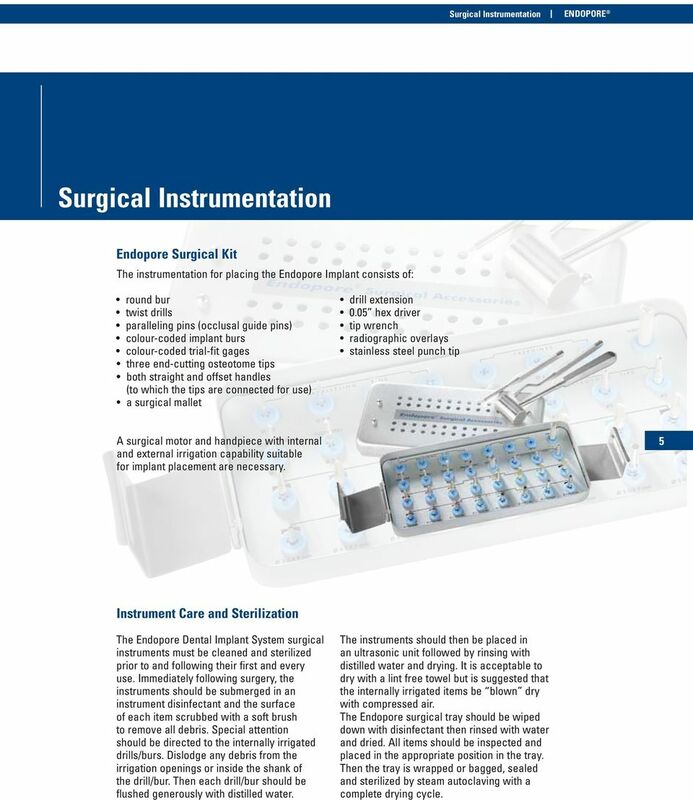 Immediately following surgery, the instruments should be submerged in an instrument disinfectant and the surface of each item scrubbed with a soft brush to remove all debris. Special attention should be directed to the internally irrigated drills/burs. Dislodge any debris from the irrigation openings or inside the shank of the drill/bur. Then each drill/bur should be flushed generously with distilled water. The instruments should then be placed in an ultrasonic unit followed by rinsing with distilled water and drying. It is acceptable to dry with a lint free towel but is suggested that the internally irrigated items be blown dry with compressed air. The Endopore surgical tray should be wiped down with disinfectant then rinsed with water and dried. All items should be inspected and placed in the appropriate position in the tray. Then the tray is wrapped or bagged, sealed and sterilized by steam autoclaving with a complete drying cycle. 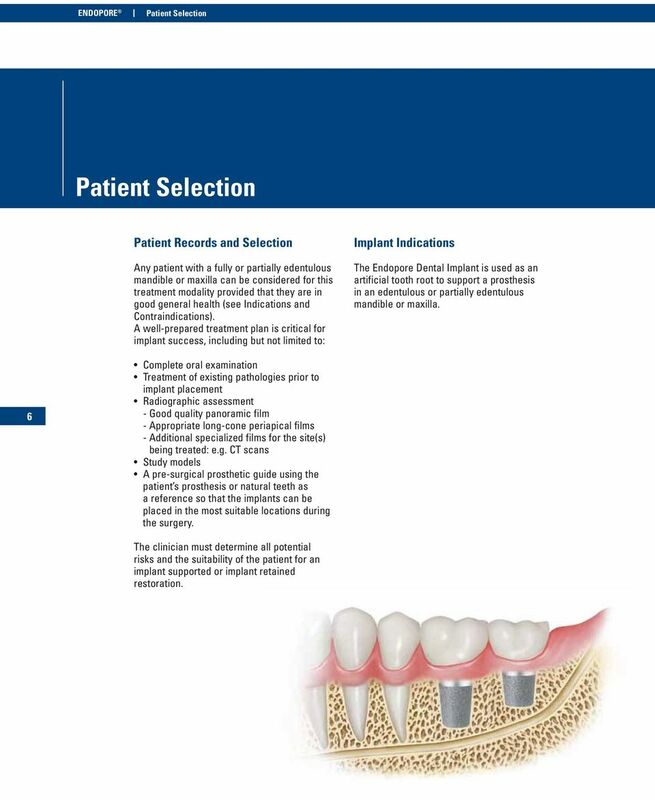 6 Endopore Patient Selection Patient Selection Patient Records and Selection Any patient with a fully or partially edentulous mandible or maxilla can be considered for this treatment modality provided that they are in good general health (see Indications and Contraindications). A well-prepared treatment plan is critical for implant success, including but not limited to: Implant Indications The Endopore Dental Implant is used as an artificial tooth root to support a prosthesis in an edentulous or partially edentulous mandible or maxilla. 6 Complete oral examination Treatment of existing pathologies prior to implant placement Radiographic assessment - Good quality panoramic film - Appropriate long-cone periapical films - Additional specialized films for the site(s) being treated: e.g. CT scans Study models A pre-surgical prosthetic guide using the patient s prosthesis or natural teeth as a reference so that the implants can be placed in the most suitable locations during the surgery. The clinician must determine all potential risks and the suitability of the patient for an implant supported or implant retained restoration. 7 Pre-Surgical Considerations Endopore Contraindications Endopore Dental Implants should not be used with patients who have contraindicating systemic or local diseases including, but not limited to: Local contraindications Oral infections or malignancies Active periodontal disease General medical contraindications Blood dyscrasias Uncontrolled diabetes Hyperthyroidism Renal disease Uncontrolled hypertension Liver problems Leukemia Severe vascular heart disease Hepatitis Any immunosuppressive disorder Relative medical contraindications Tobacco use Excessive alcohol consumption Poor oral hygiene Bruxism Nail or pencil biting Tongue habits Anatomical contraindications Insufficient ridge dimensions to accommodate proper implant placement. Ideal ridge width is considered to be 6 mm or more. 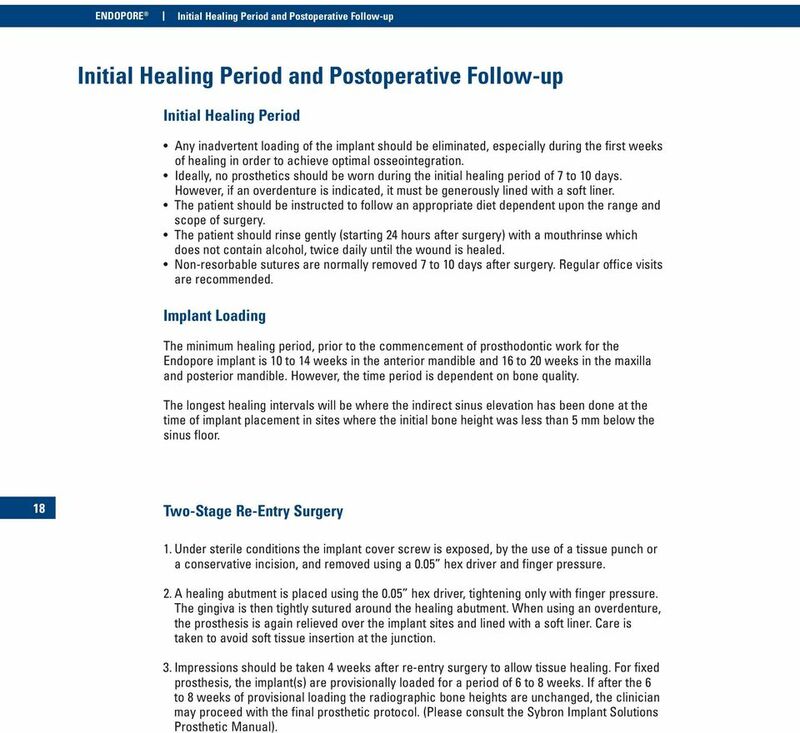 7 Pre-Surgical Considerations Scaling and root planing one to four weeks before surgery. Pre-operative intra-oral and extra-oral disinfection of the surgical site(s) with chlorhexidine mouthrinse or a similar antiseptic. 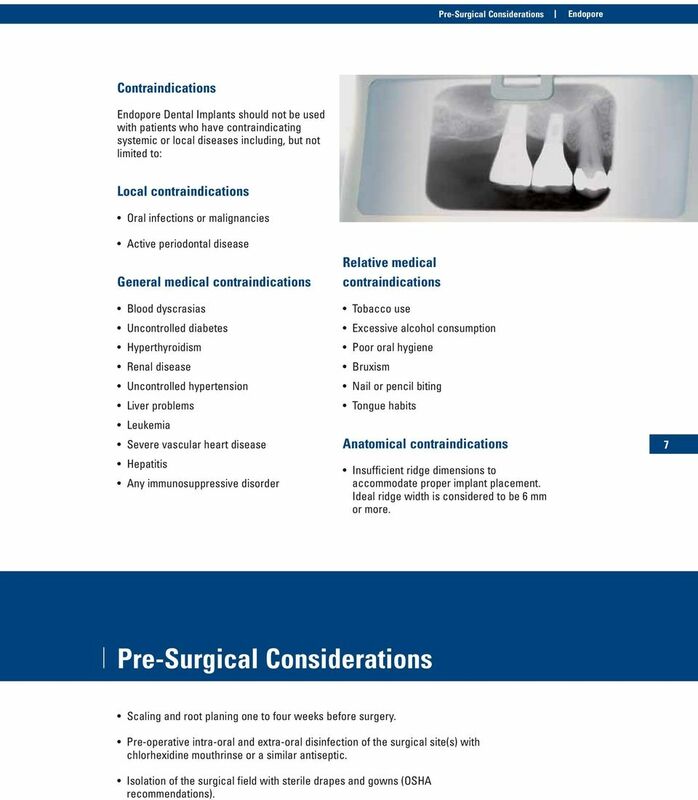 Isolation of the surgical field with sterile drapes and gowns (OSHA recommendations). 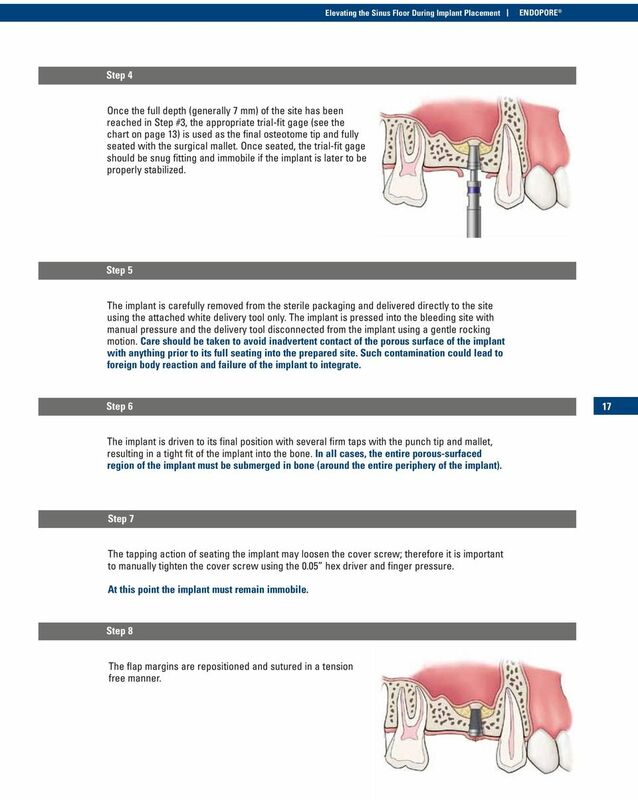 8 Endopore One-Stage and Two-Stage Implant Placement Procedure One-Stage and Two-Stage Implant Placement Procedure, Steps 1 to 5 Step 1 Elevate a full-thickness mucoperiosteal flap to expose the underlying bone. The optimal implant site is marked by perforating the upper bony cortex using a 2.3 mm round bur with the pre-surgical prosthetic guide at rpm with copious external saline irrigation. Step 2 8 Use the twist drill at a drill speed of rpm with copious internal and external sterile saline irrigation. The twist drill is indexed with markings to correspond to the various implant lengths and is used to create a site of the appropriate depth for the implants to be placed. 12 mm 9 mm 7 mm 5 mm Step 3 A paralleling pin (occlusal guide pin) is used to verify the appropriate alignment with adjacent teeth, opposing occlusion or other implants. A radiographic image is recommended. 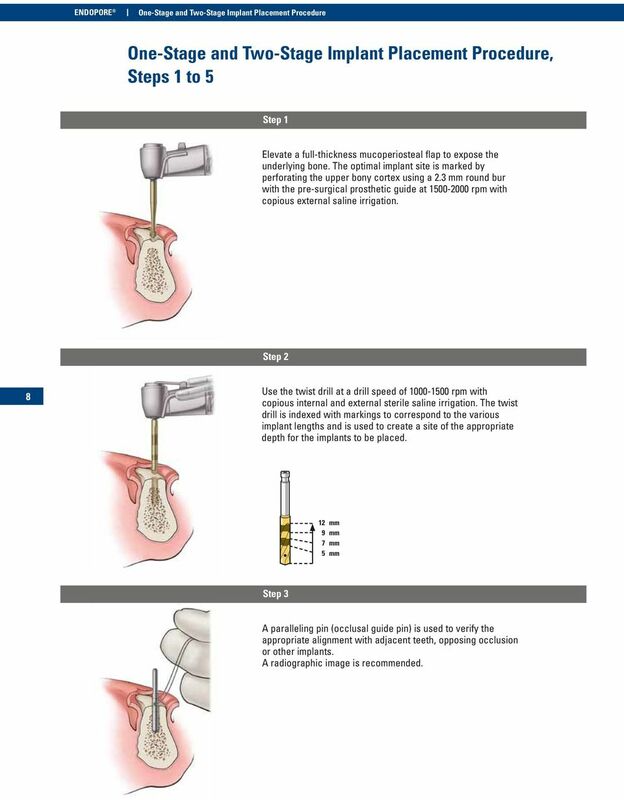 9 One-Stage and Two-Stage Implant Placement Procedure BICORTICAL Endopore Step 4 When the final depth is reached with the twist drill and the paralleling pin confirms the proper angulation, the site is expanded with the appropriate sized implant bur at a drill speed of 1000 rpm with copious internal and external sterile saline irrigation. Exact site preparation is important, especially for tapered, self-seating implants. If a 5.0 mm diameter implant is used, it is recommended to expand the osteotomy gradually by using a 4.1 mm implant bur of the same length, as an intermediate bur. Sharp burs and a high handpiece torque potential are critical to avoid overheating of bone and bur chatter; therefore, it is recommended to change burs after approximately 10 uses, depending on bone density. Surgical gauze fibers can contaminate the surface of the implant and increase the risk of implant failure; therefore, gauze should not be used near the surgical site or on the instruments used in the site preparation. 9 Step 5 Generously irrigate the osteotomy with sterile saline to remove any bone chips before checking the site with the appropriatesized trial-fit gage. The shoulder of the cone-shaped portion of the gage should be flush with or just below the crestal bone level. The trial-fit gage can be left in the first site as a guide to help achieve parallelism with other implants. For multiple implant sites it is important to ensure that the edge-to-edge interimplant distance is at least 2 to 3 mm to ensure optimal bone and soft tissue (including papilla reformation). 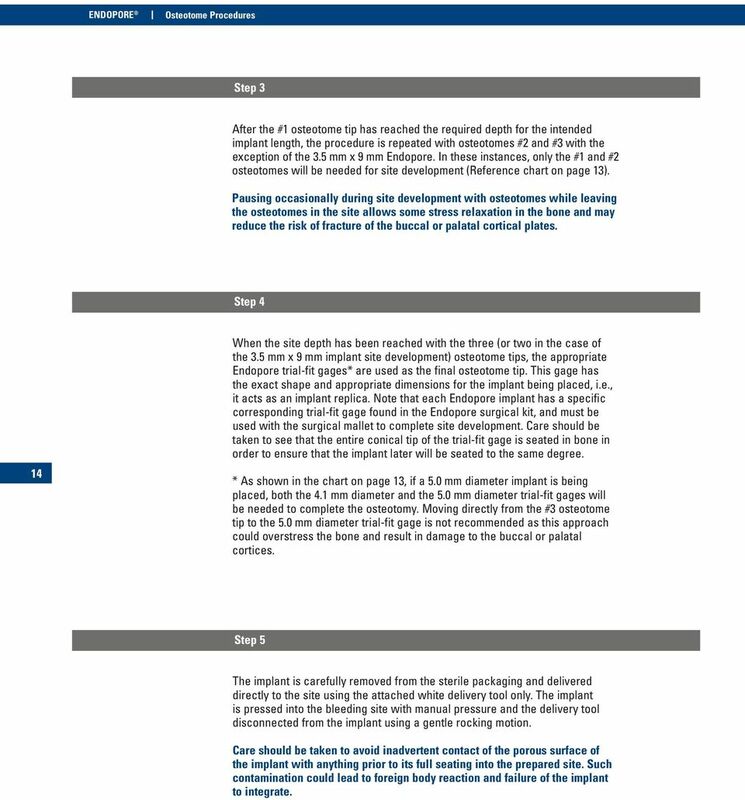 10 Endopore One-Stage Implant Placement Procedure Endopore implants with Internal Connection, One-Stage Implant Placement procedure, Steps 6 to 9 Please note the following steps refer to the Endopore One-Stage implant placement procedure. Step 6 The implant is carefully removed from the sterile packaging and delivered directly to the site using the attached white delivery tool only. The implant is pressed into the bleeding site with manual pressure and the delivery tool disconnected from the implant using a gentle rocking motion. Care should be taken to avoid inadvertent contact of the porous surface of the implant with anything prior to its full seating into the prepared site. Such contamination could lead to foreign body reaction and failure of the implant to integrate. Step 7 The implant is driven into its final position with several firm taps with the punch tip and mallet, resulting in a tight fit of the implant into the bone. 10 In all cases, the entire porous-surfaced region of the implant and the 0.5 mm smooth coronal region must be fully submerged in bone and the implant must be immobile. Step 8 The tapping action of seating the implant may loosen the cover screw; therefore it is important to tighten the cover screw using the 0.05 hex driver and finger pressure. At this point the implant must remain immobile. Step 9 The flap margins are repositioned and sutured in a tension free manner. 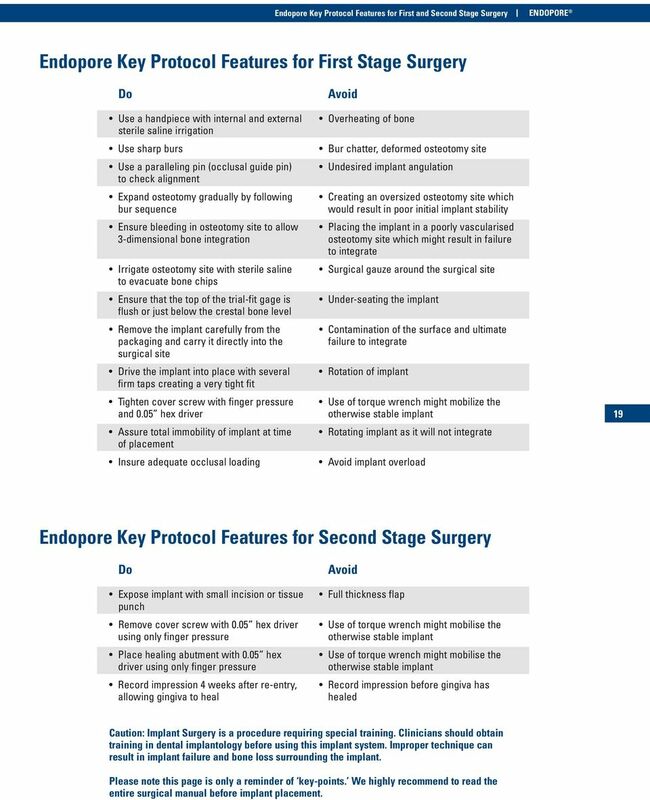 11 Two-Stage Implant Placement Procedure BICORTICAL Endopore Endopore implants with Internal Hex/External Hex Connection, Two-Stage Implant Placement procedure, Steps 6 to 9 Please note the following steps refer to the Endopore Two-Stage implant placement procedure. Step 6 The implant is carefully removed from the sterile packaging and delivered directly to the site using the attached white delivery tool only. The implant is pressed into the bleeding site with manual pressure and the delivery tool disconnected from the implant using a gentle rocking motion. Care should be taken to avoid inadvertent contact of the porous surface of the implant with anything prior to its full seating into the prepared site. Such contamination could lead to foreign body reaction and failure of the implant to integrate. Step 7 The implant is driven to its final position with several firm taps with the punch tip and mallet, resulting in a tight fit of the implant into the bone. In all cases, the entire porous-surfaced region of the implant and at least 1 mm of the smooth coronal region must be fully submerged in bone and the implant must be immobile. 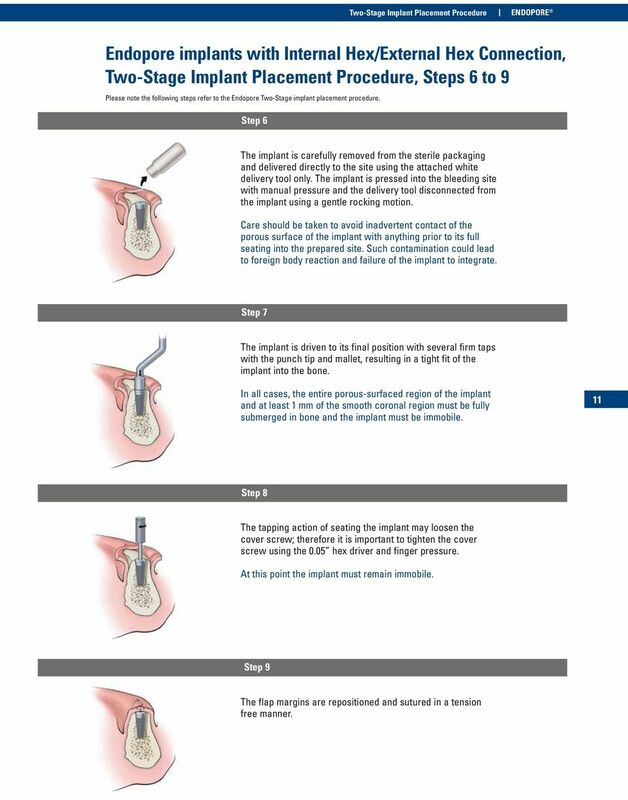 11 Step 8 The tapping action of seating the implant may loosen the cover screw; therefore it is important to tighten the cover screw using the 0.05 hex driver and finger pressure. At this point the implant must remain immobile. Step 9 The flap margins are repositioned and sutured in a tension free manner. 12 Endopore Osteotome Procedures Osteotome Procedures Implant Placement Procedure Using Osteotomes With its press-fit design, highly osteoconductive surface and integration by bone ingrowth and 3-dimensional mechanical interlock, the Endopore Dental Implant is appropriate for placement using osteotome techniques, especially in the posterior maxilla where cancellous bone (Types III & IV bone - Albrektsson and Zarb), i.e., bone of lower density but high vascularity, often predominates. In denser bone in the maxilla (Types I & II) and all sites in the mandible, placement of the implant with surgical burs is necessary. As with all dental implant procedures, sterile technique must be followed. 12 Step 1 Elevate a full-thickness mucoperiosteal flap to expose the underlying bone. The optimal implant site is marked by perforating the upper bony cortex using a 2.3 mm round bur with the pre-surgical prosthetic guide at rpm with copious external saline irrigation. Step 2 After the cortex has been perforated, the #1 osteotome tip attached to either a straight or offset handle is inserted at the appropriate angulation (for later correct implant orientation) into the marked osteotomy site. The surgical mallet is then used to deliver a series of taps to the end of the osteotome handle taking care to maintain the correct angulation of the osteotome. If the bone is as expected of Type III or IV, the osteotome will quickly advance into the osteotomy, and the development progress of the osteotomy can be measured by observing the osteotome tip s depth markings (5, 7 and 9 mm). If a simultaneous sinus floor elevation is being done using osteotomes, please see procedure, pages 15 to 17. If required, an x-ray can be taken at this point to verify the position and proper alignment of the osteotome. To do this, the handle can be unscrewed and removed and the osteotome tip left in situ for the radiograph. If considerable resistance to osteotome advancement is experienced, the twist drill may be required to establish initial partial or complete depth for the osteotomy. 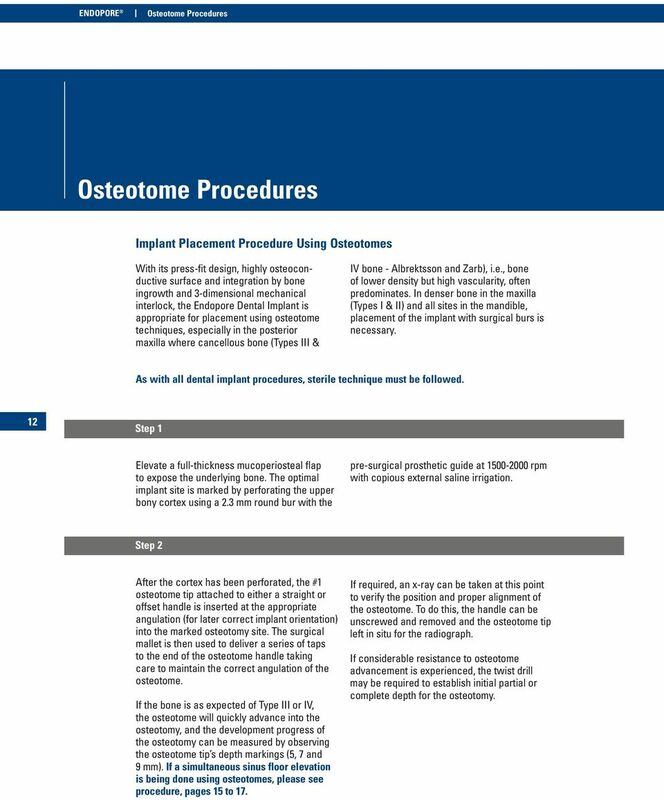 14 Endopore Osteotome Procedures Step 3 After the #1 osteotome tip has reached the required depth for the intended implant length, the procedure is repeated with osteotomes #2 and #3 with the exception of the 3.5 mm x 9 mm Endopore. In these instances, only the #1 and #2 osteotomes will be needed for site development (Reference chart on page 13). Pausing occasionally during site development with osteotomes while leaving the osteotomes in the site allows some stress relaxation in the bone and may reduce the risk of fracture of the buccal or palatal cortical plates. Step 4 14 When the site depth has been reached with the three (or two in the case of the 3.5 mm x 9 mm implant site development) osteotome tips, the appropriate Endopore trial-fit gages* are used as the final osteotome tip. This gage has the exact shape and appropriate dimensions for the implant being placed, i.e., it acts as an implant replica. 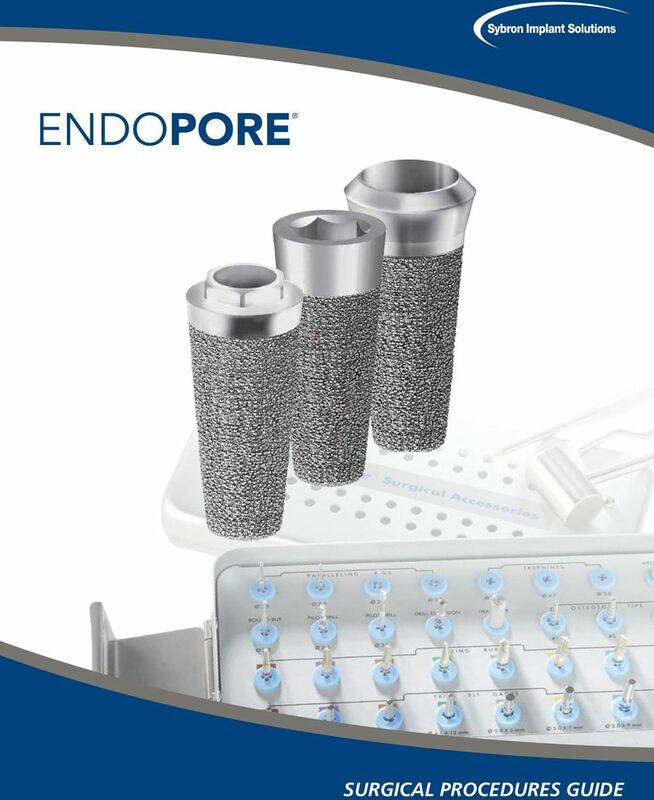 Note that each Endopore implant has a specific corresponding trial-fit gage found in the Endopore surgical kit, and must be used with the surgical mallet to complete site development. Care should be taken to see that the entire conical tip of the trial-fit gage is seated in bone in order to ensure that the implant later will be seated to the same degree. 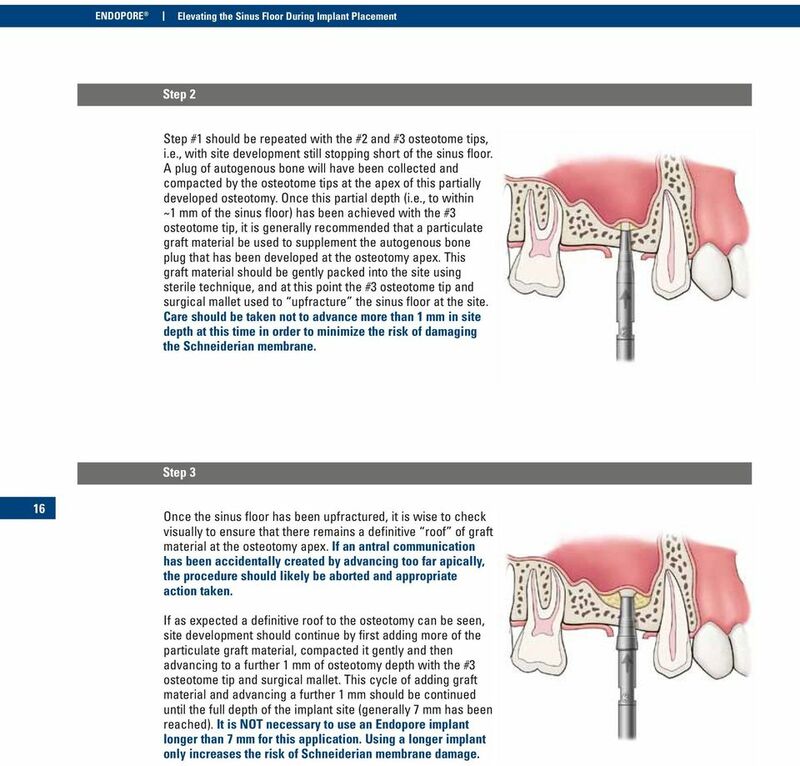 * As shown in the chart on page 13, if a 5.0 mm diameter implant is being placed, both the 4.1 mm diameter and the 5.0 mm diameter trial-fit gages will be needed to complete the osteotomy. Moving directly from the #3 osteotome tip to the 5.0 mm diameter trial-fit gage is not recommended as this approach could overstress the bone and result in damage to the buccal or palatal cortices. Step 5 The implant is carefully removed from the sterile packaging and delivered directly to the site using the attached white delivery tool only. The implant is pressed into the bleeding site with manual pressure and the delivery tool disconnected from the implant using a gentle rocking motion. Care should be taken to avoid inadvertent contact of the porous surface of the implant with anything prior to its full seating into the prepared site. Such contamination could lead to foreign body reaction and failure of the implant to integrate. 15 Osteotome Procedures BICORTICAL Endopore Step 6 The implant is driven to its final position with several firm taps with the punch tip and mallet, resulting in a tight fit of the implant into the bone. In all cases, the entire porous-surfaced region of the implant must be submerged in bone (around the entire periphery of the implant). Step 7 The tapping action of seating the implant may loosen the cover screw; therefore it is important to manually tighten the cover screw using the 0.05 hex driver and finger pressure. At this point the implant must remain immobile. Step 8 The flap margins are repositioned and sutured in a tension free manner. 15 Elevating the Sinus Floor During Implant Placement If there is less than 7 mm (and a minimum of 3 mm) of subantral bone existing below the sinus at an intended implant site and the operator wishes to place a 7 mm long Endopore implant, the sinus floor may be locally elevated with the osteotome tips at the time of implant placement with the following procedural modifications. Step 1 Using the appropriate pre-operative radiographs, the height of subantral bone at the intended implant site is determined. With this information, it will be known how deeply the #1 osteotome tip can advance without contacting the actual sinus floor. Generally, this first osteotome tip should be advanced with the aid of the surgical mallet to a depth about 1 mm short of touching the sinus floor. A distinct change in sound and feel would indicate that the osteotome has reached the denser sinus floor. A periapical radiograph may be taken at any point in this step to verify the depth of penetration of the osteotome tip in relation to the sinus floor. 16 Endopore Elevating the Sinus Floor During Implant Placement Step 2 Step #1 should be repeated with the #2 and #3 osteotome tips, i.e., with site development still stopping short of the sinus floor. A plug of autogenous bone will have been collected and compacted by the osteotome tips at the apex of this partially developed osteotomy. Once this partial depth (i.e., to within ~1 mm of the sinus floor) has been achieved with the #3 osteotome tip, it is generally recommended that a particulate graft material be used to supplement the autogenous bone plug that has been developed at the osteotomy apex. This graft material should be gently packed into the site using sterile technique, and at this point the #3 osteotome tip and surgical mallet used to upfracture the sinus floor at the site. Care should be taken not to advance more than 1 mm in site depth at this time in order to minimize the risk of damaging the Schneiderian membrane. Step 3 16 Once the sinus floor has been upfractured, it is wise to check visually to ensure that there remains a definitive roof of graft material at the osteotomy apex. If an antral communication has been accidentally created by advancing too far apically, the procedure should likely be aborted and appropriate action taken. If as expected a definitive roof to the osteotomy can be seen, site development should continue by first adding more of the particulate graft material, compacted it gently and then advancing to a further 1 mm of osteotomy depth with the #3 osteotome tip and surgical mallet. 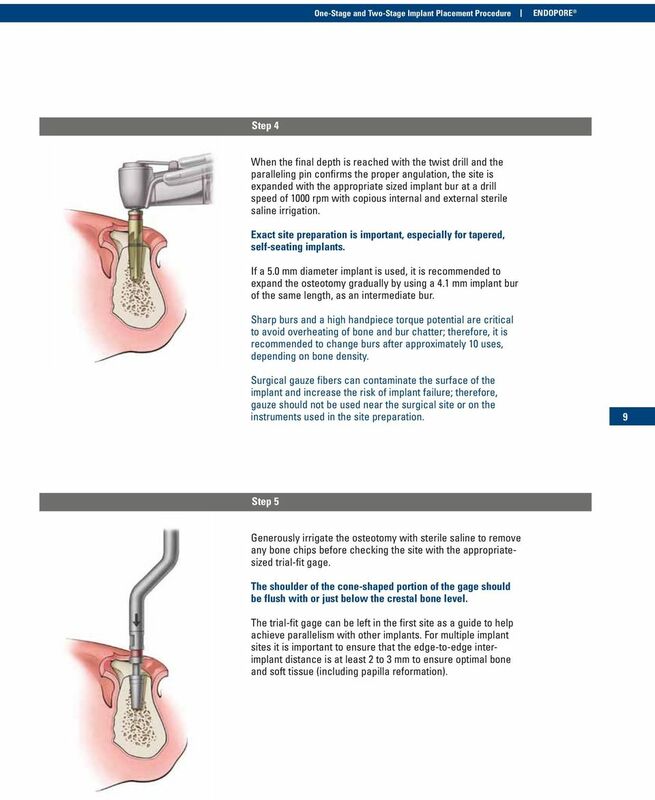 This cycle of adding graft material and advancing a further 1 mm should be continued until the full depth of the implant site (generally 7 mm has been reached). It is NOT necessary to use an Endopore implant longer than 7 mm for this application. Using a longer implant only increases the risk of Schneiderian membrane damage. 17 Elevating the Sinus Floor During Implant Placement BICORTICAL Endopore Step 4 Once the full depth (generally 7 mm) of the site has been reached in Step #3, the appropriate trial-fit gage (see the chart on page 13) is used as the final osteotome tip and fully seated with the surgical mallet. Once seated, the trial-fit gage should be snug fitting and immobile if the implant is later to be properly stabilized. Step 5 The implant is carefully removed from the sterile packaging and delivered directly to the site using the attached white delivery tool only. The implant is pressed into the bleeding site with manual pressure and the delivery tool disconnected from the implant using a gentle rocking motion. Care should be taken to avoid inadvertent contact of the porous surface of the implant with anything prior to its full seating into the prepared site. Such contamination could lead to foreign body reaction and failure of the implant to integrate. Step 6 17 The implant is driven to its final position with several firm taps with the punch tip and mallet, resulting in a tight fit of the implant into the bone. In all cases, the entire porous-surfaced region of the implant must be submerged in bone (around the entire periphery of the implant). Step 7 The tapping action of seating the implant may loosen the cover screw; therefore it is important to manually tighten the cover screw using the 0.05 hex driver and finger pressure. At this point the implant must remain immobile. Step 8 The flap margins are repositioned and sutured in a tension free manner. 18 Endopore Initial Healing Period and Postoperative Follow-up Initial Healing Period and Postoperative Follow-up Initial Healing Period Any inadvertent loading of the implant should be eliminated, especially during the first weeks of healing in order to achieve optimal osseointegration. Ideally, no prosthetics should be worn during the initial healing period of 7 to 10 days. However, if an overdenture is indicated, it must be generously lined with a soft liner. The patient should be instructed to follow an appropriate diet dependent upon the range and scope of surgery. The patient should rinse gently (starting 24 hours after surgery) with a mouthrinse which does not contain alcohol, twice daily until the wound is healed. Non-resorbable sutures are normally removed 7 to 10 days after surgery. Regular office visits are recommended. Implant Loading The minimum healing period, prior to the commencement of prosthodontic work for the Endopore implant is 10 to 14 weeks in the anterior mandible and 16 to 20 weeks in the maxilla and posterior mandible. However, the time period is dependent on bone quality. The longest healing intervals will be where the indirect sinus elevation has been done at the time of implant placement in sites where the initial bone height was less than 5 mm below the sinus floor. 18 Two-Stage Re-Entry Surgery 1. Under sterile conditions the implant cover screw is exposed, by the use of a tissue punch or a conservative incision, and removed using a 0.05 hex driver and finger pressure. 2. A healing abutment is placed using the 0.05 hex driver, tightening only with finger pressure. The gingiva is then tightly sutured around the healing abutment. When using an overdenture, the prosthesis is again relieved over the implant sites and lined with a soft liner. Care is taken to avoid soft tissue insertion at the junction. 3. Impressions should be taken 4 weeks after re-entry surgery to allow tissue healing. For fixed prosthesis, the implant(s) are provisionally loaded for a period of 6 to 8 weeks. If after the 6 to 8 weeks of provisional loading the radiographic bone heights are unchanged, the clinician may proceed with the final prosthetic protocol. (Please consult the Sybron Implant Solutions Prosthetic Manual). 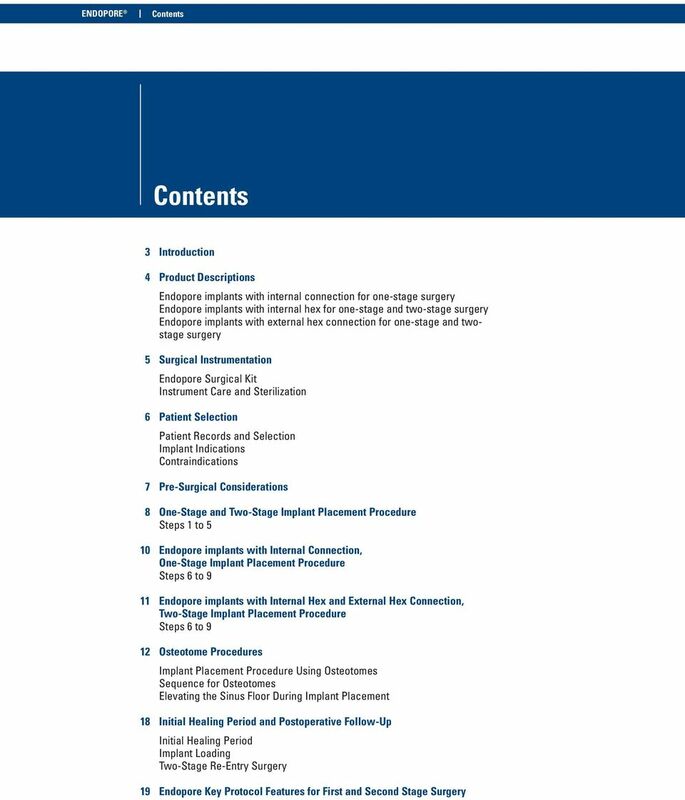 19 Endopore Key Protocol Features for First and Second Stage Surgery BICORTICAL Endopore Endopore Key Protocol Features for First Stage Surgery Do Use a handpiece with internal and external sterile saline irrigation Use sharp burs Use a paralleling pin (occlusal guide pin) to check alignment Expand osteotomy gradually by following bur sequence Ensure bleeding in osteotomy site to allow 3-dimensional bone integration Irrigate osteotomy site with sterile saline to evacuate bone chips Ensure that the top of the trial-fit gage is flush or just below the crestal bone level Remove the implant carefully from the packaging and carry it directly into the surgical site Drive the implant into place with several firm taps creating a very tight fit Tighten cover screw with finger pressure and 0.05 hex driver Assure total immobility of implant at time of placement Insure adequate occlusal loading Avoid Overheating of bone Bur chatter, deformed osteotomy site Undesired implant angulation Creating an oversized osteotomy site which would result in poor initial implant stability Placing the implant in a poorly vascularised osteotomy site which might result in failure to integrate Surgical gauze around the surgical site Under-seating the implant Contamination of the surface and ultimate failure to integrate Rotation of implant Use of torque wrench might mobilize the otherwise stable implant Rotating implant as it will not integrate Avoid implant overload 19 Endopore Key Protocol Features for Second Stage Surgery Do Expose implant with small incision or tissue punch Remove cover screw with 0.05 hex driver using only finger pressure Place healing abutment with 0.05 hex driver using only finger pressure Record impression 4 weeks after re-entry, allowing gingiva to heal Avoid Full thickness flap Use of torque wrench might mobilise the otherwise stable implant Use of torque wrench might mobilise the otherwise stable implant Record impression before gingiva has healed Caution: Implant Surgery is a procedure requiring special training. Clinicians should obtain training in dental implantology before using this implant system. Improper technique can result in implant failure and bone loss surrounding the implant. Please note this page is only a reminder of key-points. 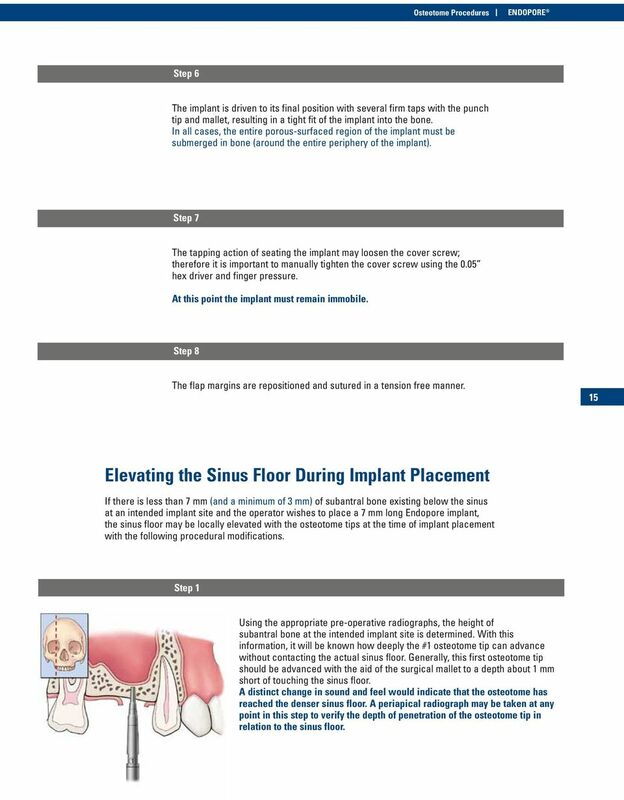 We highly recommend to read the entire surgical manual before implant placement. Boston College, BS in Biology 1980-1984. University of Southern California, Doctor of Dental Surgery, DDS, 1990. PREPARATION OF MOUTH FOR REMOVABLE PARTIAL DENTURES Dr. Mazen kanout Mouth preparation includes procedures in four categories: 1. Oral Surgical Preparation. 2. Conditioning of Abused and Irritated Tissue.